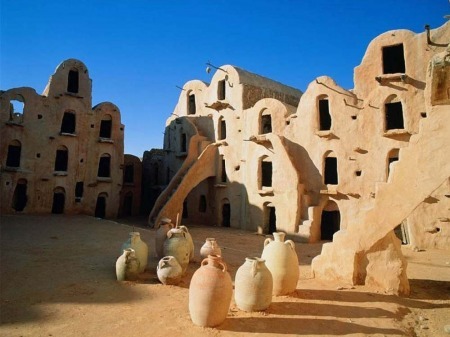 A 7 Days, Tunisia Dicovery tour with overnight stay in Guest houses or Charm hotels. End the tour in the relaxing island of Djerba. Arrival at the airport, welcome and greet by our representative and transfer to Tunis Old town called “Medina” (a UNESCO World Heritage). Check in at guest house Dar Lemdina for the overnight. After breakfast we start the day by the visit of Bardo museum where the largest mosaic collection in the world is. 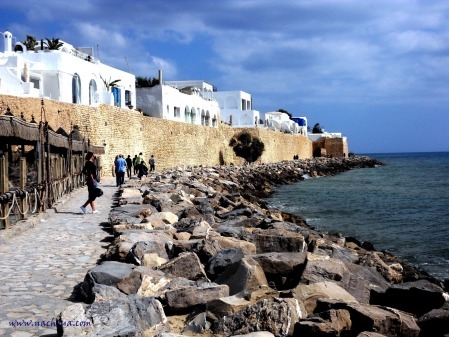 Nearby is the blue and white village of Sidi Bou Said. Free time to discover the beauty of this Mediterranean village and see the Andalusian architecture that inspired for years many painters and artists. Drive back to Dar Lemdina for the overnight stay. Departure from Tunis after breakfast to visit one of the richest regions of Tunisia: the Cap Bon peninsular starting with El Haouaria, the nearest point of the Tunisian land to Italy, which is located only 140 kilometers away. In Haouaria, we’ll visit the roman quarries from where the stones were taken and shipped over to Carthage to build its monuments. We then continue to Kerkouane to visit the unique Carthaginian site in the world, the only site that after being destroyed by the Romans was never inhabited. We’ll visit as well the local small but interesting museum. Before we start driving toward the administrative capital of the peninsular, we will stop at the fishing port of Kelibia where boats and ships are constructed too. From the port we can see the imposing Carthaginian fort of the ancient Klupia. The last stop will be at Nabeul, the capital of the pottery and ceramic works. A visit of one of the hundreds of the workshops then finish the day in the coastal town of Hammamet. Check in at guest house “Villa Phenicia” owned by Italian resident in Hammamet. Departure from Hammamet after breakfast to visit the 4th largest city of Tunisia, the town of Sousse and concentrate mainly on its Medina tracing back to the 13th century when Arab Muslims built it on the top of the ancient Hadrumetum. Just over an hour drive away from Sousse and further south stands the largest monument left in North Africa tracing back to Roman time: the coliseum of El Jem, the Roman Thysdrus. Visit of the 3rd century amphitheatre then continue Sfax. The town of Sfax is the 2nd largest city of the country and the first industrial town. 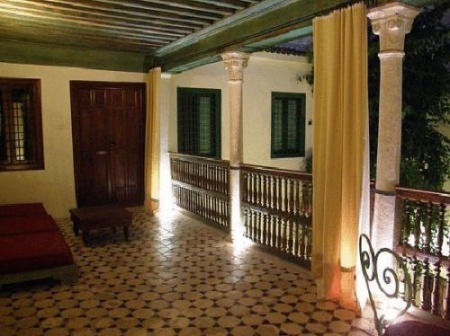 The night will be spent at Guest house “Dar Selma” in Sfax. Departure after breakfast further south to the coastal town of Gabes to visit its local market famous for spices, henna and baskets locally made. Continuation to Matmata, the unique village I the south of Tunisia known for the troglodyte architecture and the cave dwelling homes. To escape the heat, the Berber tribe of Matmata dug their homes in the lime stone of the hills and the mountains. In a very lunar landscape, we carry on in the afternoon driving through the south of Tunisia and all the way to the biggest Berber center the town of Tataouine, the name that inspired George Lucas in his film Star wars. Arrival at Tataouine and check in at the charm house “Dar Kenza”. The morning will be spent in the area visiting the distinguished architecture of the local Berber villages of Chenini and Douiret, two of them built on the top hills and taking advantage of the height to protect their villages from any possible invader in the olden days. Many of the Berber tribes and to avoid carrying their goods with them every time they had to move built the famous Ksour (plural of Ksar) and they are mainly found in that area. Therefore visiting one of them is a must especially the one we selected is finest and most preserved: Ksar Ouled Sultan (a huge old Berber granary). The last drive of the day is to get to the largest island of North Africa using the old Roman cause way: the island of Djerba. Depending on the time of arrival, we will visit as many places as possible such as Guellela, Houmet Essouk, the synagogue and the fishing port. Check in at the guest house “Dar Bibine” in Djerba. After breakfast, departure to Djerba airport for the internal flight to Tunis then the international flight back to your destination. Entrance fee to historical sites and museums.